This project represents the 3rd of a partnership between GISS and the Thousand Islands Boat Museum. The previous projects were a St Lawrence Skiff, and the building of Opti-Class sailboats, both of these initiatives involved high school students, and were built on-site at the high school. Boat Museum Director Susanne Richter approached myself and my teaching partner Geoff Dopking through our Principal Chris Boston about having intermediate students involved in a similar project for this year--- with a distinct difference.... using the museum (a working boat museum) as our classroom! After many planning sessions, it was agreed upon by the Museum and the teachers, the best way to impact our learners into appreciating the historical, cultural, and economic opportunities that exist (in their backyard), the 1000 islands.... is to get them on the river! From there the Team crafted a plan for the students to receive first hand instruction on the safe operation of a watercraft (Boat Operator's Card). While onsite, students are instructed by museum staff and local experts including Chris McCarney (owner of the Gananoque Boat Line). The lessons that are taught include learning material using a hand- on approach. Learning to use a signal flare can be acquired by reading the label, however when the students see and feel the intense heat generated by having one lit, the knowledge is lasting and embedded! Similarly, the students have learned how to troubleshoot an outboard motor through volunteer marine mechanic George Griffin. The skill of tearing down a motor to see if there is a spark present... cannot be taught from a textbook or YouTube! The other main focus of the program us to afford the students the opportunity to use their boat operator's card to explore their backyard... A vision of Susanne and the Museum's Board of Directors. Susanne was able to procure a 1956 1000 Islands built boat, through donation as a vessel that the students may loan from the museum, to "get out on the water!" The only problem being the boat is in need of minor restoration. Once the lesson has finished in the classroom the students roll up their sleeves, don safety equipment and sand, prime, and paint the "Bobby Gerrard", with the assistance of museum personnel former GSS student Brooke Gipson, and volunteer Majella Turcotte. The learning continues at GISS, as students have to record their new knowledge in their Blogs, and also work on larger group based projects including promoting the program, and model construction. Both Running and Dopking are thrilled at the opportunity afforded to the students by the museum and the vision of its Team... we are learning that the River is key to the economy if the area, and if we respect the River, it will respect us! 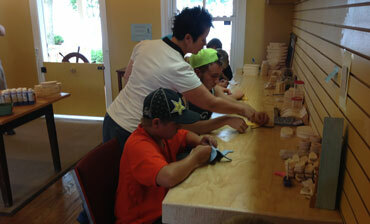 The Boat Shop at the Museum is an authentic working shop, active whenever the Museum is open. The Shop undertakes construction and restoration projects around which classes in boatbuilding and woodworking are structured. 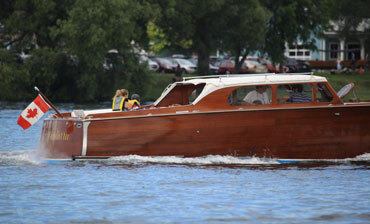 Finished projects are launched into the St. Lawrence River for the enjoyment of the public. 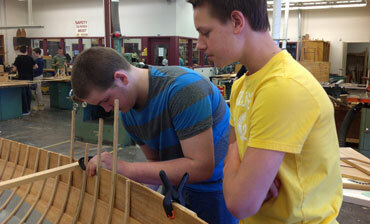 Boat building and restoration classes for local high school students takes place on-site at the Museum throughout the year and during the summer months. •	45 grade 7 students from G.I.S.S. visit the Museum every Thursday throughout the school year. Half of the day is spent restoring a 1956 Gerrard runabout, and the rest of the time students learn boating safety in anticipation of writing the Boater’s Exam in spring 2016, (the exam will be administered by the Museum on-site). The Museum is committed to getting kids onto the river. For centuries, sailing has been part of River life, and every summer the Museum provides sailing courses to give local Gananoque children a fun introduction to the sport of sailing. Three (3), one-week sessions are typically offered. Students will get a basic introduction, upgrades to their current qualifications and learn to be comfortable and safe around boats. They will also be offered an opportunity to learn correct fundamental movement on the vessels and build overall sports skills. The emphasis is on fun, with lots of games and on-land (and on islands) activities as well as a chance to get out on the water on small, two-person sailing dinghies. 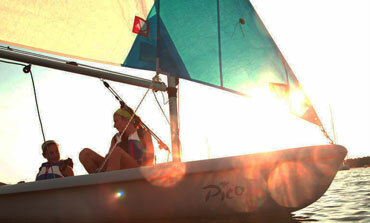 The program teaches children the basics of sailing using Sail Canada’s CANSail 1 & 2 standards. For more information contact the Museum directly, or like us on Facebook to get information about current and upcoming programs. The Museum is committed to providing ongoing accessible cultural, social, and educational children’s summer programming. Aimed at children 4-12 years old, the Children's Activity Center is first and foremost a place of belonging, enlivened by experiential learning, vibrant storytelling, relevant activities, and events. Its environment is inviting, playful and comfortable for children and caregivers alike. Children’s programming activities enrich and broaden children’s lives by providing them with a creative space in which to learn about the river by kindling their appreciation and interest in boats, and by offering the means to explore the river and create their own stories. A mix of scheduled sessions and drop-in hours take place weekly throughout the summer months. Experienced educators combine fun filled arts and crafts activities that are directly linked to the history of the river and heritage traditions of the boat industry of the region. Local customs and culture come alive for young and old in “the green cottage”, a warm and encouraging learning environment on the Gananoque waterfront. Contact the Museum directly, or like us on Facebook to get information about class schedules. Still under development, the in-water fleet will be used to promote the magic of the St. Lawrence River and the 1000 Islands, and will stimulate the cultural development of the community by encouraging people to use these examples of living history. The fleet will be showcased and stored in the Boat House, an impressive structure being built on the waterfront in front of the Museum buildings. The Boathouse will be an essential part of the Museum, used for an array of purposes such as boat shows, transient dockage, private and public events, sailing school, children’s leisure activities, etc. Future Museum plans include opportunities for local residents and tourists to get out into boats to row, sail, paddle, cruise and play. Ideally, the in-water fleet will one day include a shuttle boat(s) to be used for service back and forth between Gananoque and Clayton.